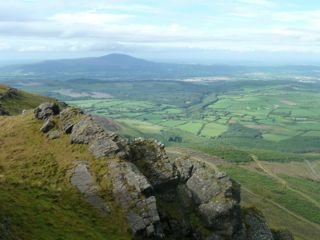 Knockanaffrin is the third highest mountain in the Comeragh Mountains area and the 75th highest in Ireland. Park in the Nire Valley car park S 277 128 A, room for 20 cars, but note this fills up fast on weekends, walk up hill on a grassy then heatherly slope from the easten edge of the carpark following approximately a line of white wooden posts. Walk through a small gate on a sheep fence and follow the track uphill, downhill then gently uphill again to the gapS301 133 B. Do not cross the stile here but turn NW keeping the fence, and an increasing vertical drop, to your right. 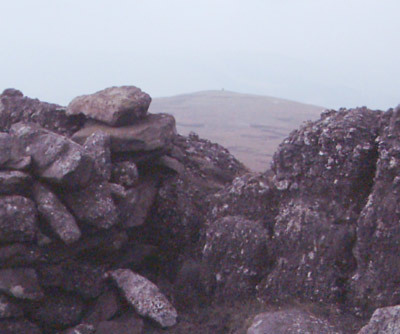 There is a fence to be crossed just below the outcrop of rocks before the summit. 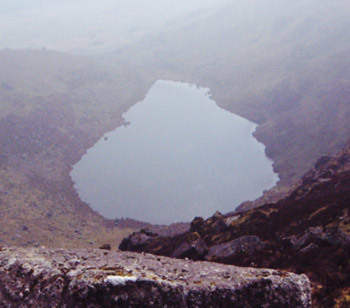 The picture shows Coumduala Lough, SE of Knockanaffrin. Writing of this Claude Wall [Mountaineering in Ireland] said “There is a row of perpendicular boiler plated slabs about twenty feet in height, high in the cliff above Coumduala Lough, which provides an exciting traverse.” I’m not quite sure where he meant, but certainly walking along the edge amongst the various rocky outcrops gives quite a sense of exposure. 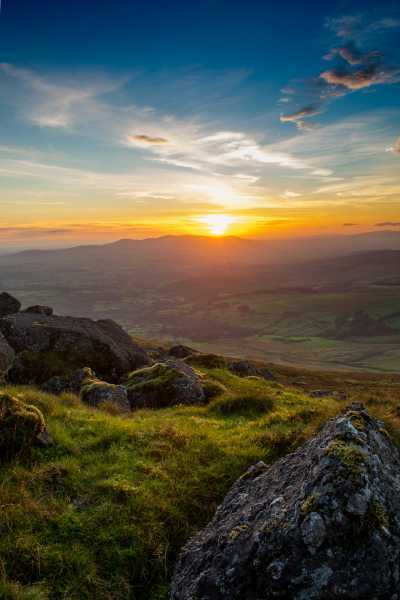 The actual summit is a jutting outcrop of the conglomerate rock that much of the Comeraghs are made of. 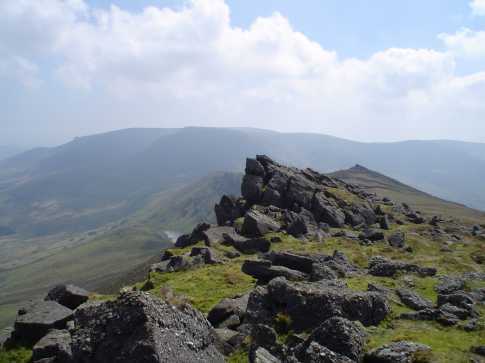 The presence of such outcrops on summits (tors) in the area is thought to indicate that these mountain tops were not overridden by the icesheets of the recent ice-ages. During the primary triangulation of Ireland Knockannafrin was a key point around 1829.